08.08.18 09:28;Account;Receive;Received Payment 4.00 USD from account U15797809 to account U1294000. Batch: 223940850. Memo: API Payment. Withdraw to allhyips from Nexio Investment Limited. 09.08.18 08:16;Account;Receive;Received Payment 4.00 USD from account U15797809 to account U1294000. Batch: 224052607. Memo: API Payment. Withdraw to allhyips from Nexio Investment Limited. 10.08.18 10:57;Account;Receive;Received Payment 4.00 USD from account U15797809 to account U1294000. Batch: 224188285. Memo: API Payment. Withdraw to allhyips from Nexio Investment Limited. 11.08.18 05:00;Account;Receive;Received Payment 4.00 USD from account U15797809 to account U1294000. Batch: 224276872. Memo: API Payment. Withdraw to allhyips from Nexio Investment Limited. 13.08.18 09:55;Account;Receive;Received Payment 4.00 USD from account U15797809 to account U1294000. Batch: 224513473. Memo: API Payment. Withdraw to allhyips from Nexio Investment Limited. 12.08.18 11:48;Account;Receive;Received Payment 4.00 USD from account U15797809 to account U1294000. Batch: 224416735. Memo: API Payment. Withdraw to allhyips from Nexio Investment Limited. 14.08.18 10:06;Account;Receive;Received Payment 4.00 USD from account U15797809 to account U1294000. Batch: 224633637. Memo: API Payment. Withdraw to allhyips from Nexio Investment Limited. 15.08.18 09:02;Account;Receive;Received Payment 4.00 USD from account U15797809 to account U1294000. Batch: 224741162. Memo: API Payment. Withdraw to allhyips from Nexio Investment Limited. 16.08.18 10:30;Account;Receive;Received Payment 4.00 USD from account U15797809 to account U1294000. Batch: 224866839. Memo: API Payment. Withdraw to allhyips from Nexio Investment Limited. 18.08.18 11:19;Account;Receive;Received Payment 4.00 USD from account U15797809 to account U1294000. Batch: 225088838. Memo: API Payment. Withdraw to allhyips from Nexio Investment Limited. 17.08.18 09:59;Account;Receive;Received Payment 4.00 USD from account U15797809 to account U1294000. Batch: 224981719. Memo: API Payment. Withdraw to allhyips from Nexio Investment Limited. 19.08.18 12:03;Account;Receive;Received Payment 4.00 USD from account U15797809 to account U1294000. Batch: 225185952. Memo: API Payment. 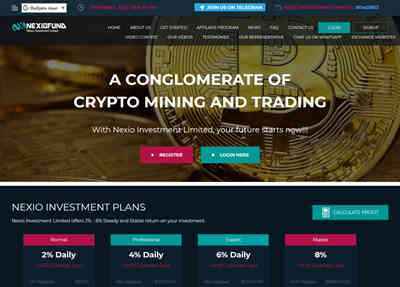 Withdraw to allhyips from Nexio Investment Limited.